Tag Archives: How did the Indians eat acorns? Nature never ceases to amaze me. Did you know that a woodpecker has a tongue that is twice the length of its beak? It is so long, when not in use, it wraps up inside the bird’s head cavity. When it is in use, it drills down ant hills and scoops out the prey. Here’s the sad part. When there aren’t enough acorns, woodpeckers die. And you know the dead trees that are full of holes that are full of acorns? Those are called granaries and they take years to build up and support woodpecker communities. As more and more people learn to enjoy cooking with acorns, I hope they will not forget the myriad of woodland animals who depend on them for food. It’s that time of year. Let’s gather acorns. But let’s leave an abundance for the birds. Acorn Crackers… It’s About Time! Those of you who’ve known me for decades, know that I’m the lady who wanders into the forest gathering acorns and shows up at potlucks with a bowl of acorn dip. Back in the late 1970’s I truly believed that I could live off the land and eating acorns was an obvious choice. I knew the Indians leached them but I wasn’t sure how they did that. I went to the library and could find nothing but a few pictures and the fact that they leached them. I received more than my fair share of stomach aches trying to figure out how many days were necessary to leach acorns. 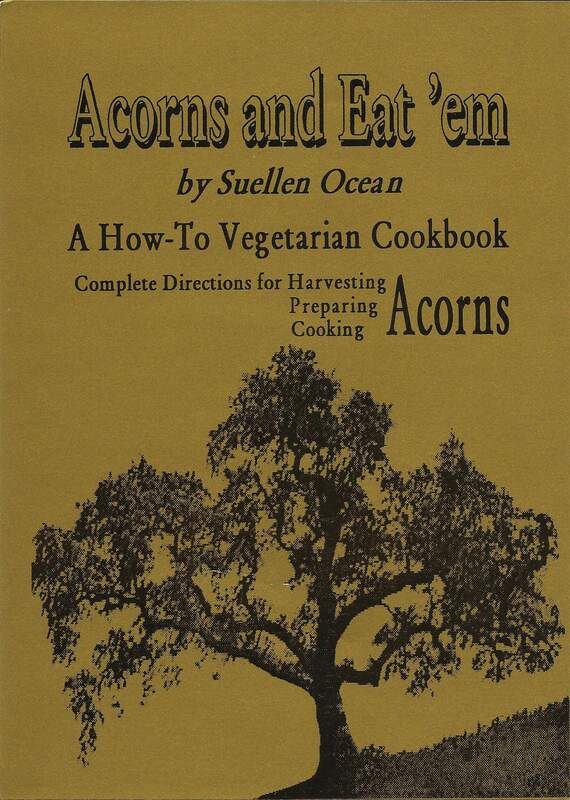 Eventually I did and as the years progressed I got pretty fancy with acorns and wrote directions for leaching acorns and all the recipes I created and put them into a how-to cookbook and field guide. One of those recipes I came up with was “Acorn Crunchies.” If you do it just right, acorns can be made into a crunchie treat. Well guess what? Someone has finally brought to market an acorn cracker and though I haven’t tasted it yet the pictures look delicious. The folks who are bringing this to market have asked me if I would share their news. Here is the link to their website where you can see their beautiful, tasty-looking crackers. www.mightywild.com Good luck folks! What Do Acorns And Fine Wine Have in Common? What do acorns and fine wine have in common? The acorns come from the oak tree and fine wine is aged in an oak barrel. But there is another aspect shared between wine and acorns and it isn’t just the tannic acid. It’s the way acid can be removed that’s interesting. I was listening to a wine expert on the radio and he said there were some tests done to remove acid from wine. The procedure that brought the best flavor was the one where wine was poured “twelve times” back and forth between two decanters. It turns out that oxygen breaks down tannic acid. A red light went off in my head because for decades I’ve been leaching acorns and I hadn’t realized the important role oxygen played in removing acid from the acorns. Doubt if I’ll be pouring my acorns back and forth twelve times but I’ll let them spend more time exposed to the air. It might help sweeten them. Eating Acorns: Is It OK If They Are Dry? Take a small paper bag (not plastic because the acorns sweat) and get me some acorns (please). You can’t just pick up any old acorn because there are probably plenty of them laying there from last year. I want fresh ones. The good ones should feel heavy in your hand, like there’s a little ball in there. If it feels heavy then take a look at it. Does it look faded like it’s been through the summer? If so, ditch it. It should look new. Also check for worm holes. If there are worm holes ditch it. Tanoak trees are a cross between a chestnut and an oak. Perhaps that is why they are so delicious. They grow profusely in the coastal mountain ranges of Northern California, especially Mendocino, Humboldt and Santa Cruz. If you’re in those areas, get a little paper bag and follow the instructions above. You won’t be disappointed. Sometimes there is a problem with acorns being infested with worms. They can ruin your whole basket of acorns if you leave them to it. There are a couple of ways I solve this problem. First off, I usually recognize that I’ve gathered some worms along with my acorns. You can tell because the acorn will have a little dot or little hole in it. If you’re lucky the worm didn’t get too far into the acorn. Once they do though, they will chew through the whole thing and a basket of acorns can turn to dust in no time. If you have a wood stove, place the acorns near the stove where the heat will kill the worms. If you have sunny weather, place them in the hot sun, open in a basket. You can also go ahead and shell them and dispose of the worms but if you won’t be getting around to them for awhile, try the wood stove or the bright sunshine (I live in sunny California). Eating Acorns… Are They Fattening or Just Delicious? The best way to crack acorns is with a “Texan Nut Sheller”. Even after thirteen years it is still razor sharp. It works especially well on dry acorns. Be careful it is very sharp, NO KIDS and WATCH YOUR FINGERS!